حمل مذكره الفارس في اللغه الانجليزيه للصف الثالث الاعدادى الترم الثانى لمستر إسلام احمد. اليكم تحميل أحدث مذكرات اللغه الانجليزيه الكاملة للصف الثالث الاعدادى الترم الثانى. تحميل مذكره الفارس في اللغه الانجليزيه ، مذكرة شرح وتدريبات ومراجعة دروس وقواعد وكلمات وقصة منهج اللغة الإنجليزية الصف الثالث الاعدادي الفصل الدراسي الثاني. 1- You want to book single ticket to Tanta. Could I book a single ticket to Tanta, please? 2- You ask how long the journey to Cairo. How long does the journey to Cairo ? 3- You want to ask about the price of the train ticket to Sohag. How much is the train ticket to Sohag ? 4- You want to book a ticket for the train from Cairo to Luxor. You are coming back on Thursday. Can I book a return ticket to Luxor, please? I’m coming back on Thursday. : How long does the stopping train take ? Tourist : I don‟t want to wait for two hours, so I‟ll take the stopping train.....................................................? 3- Your train leaves on Friday at 2.45.p.m. Book a ticket. A passenger is booking a ticket to Port Said Passenger: I‟d like a ticket to Luxor, please............................. ........................? Assistant: There‟s an express train in an hour. Passenger: ...................................................................................? 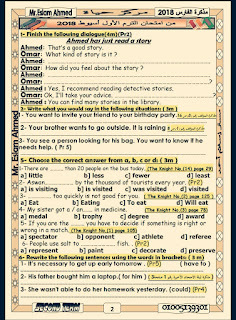 ................................................................................................................. 2- Write what you would say in the following situations: ( 3m ) 1- You want to ask the assistant when the final train to Cairo leaves. 3- You want to buy a train ticket to Qena. Book a ticket. going to do now?" she said. But then a policeman came and said to her kindly "Good morning. Don't you like any of our colours today? " 3- How did the policeman talk to Mrs Green ? 2- The lesson ........... at 10.00 tomorrow. You can look at the timetable. رابط التحميل المباشر لمذكرة منهج اللغة الإنجليزية الصف الثالث الاعدادى الترم الثانى.